Just gorgeous. Of course were talking about the bride. 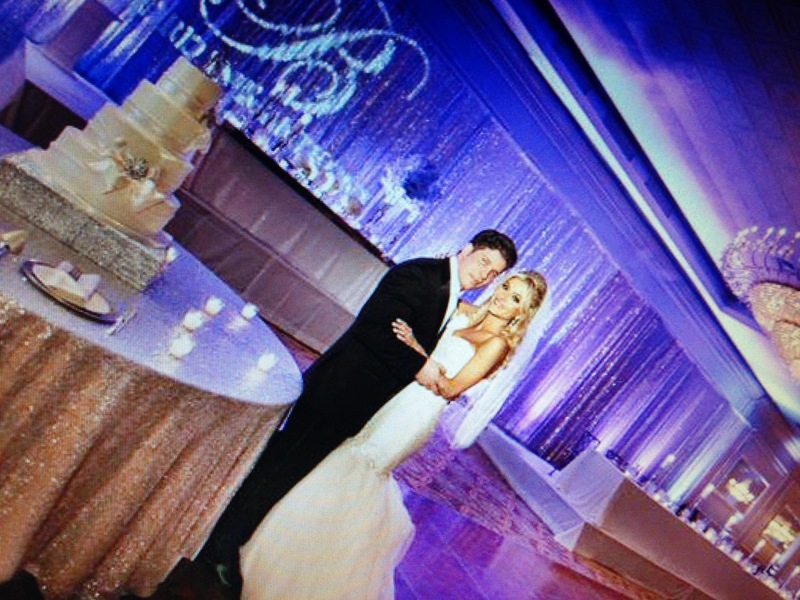 This beautiful ballroom is draped with a beautiful fabric that has sequins and the up lighting is in lavender. To bring out the sequence you do want to apply it as much as you can, meeting putting and up lighting on the brightest setting and setting the up light at least 4 feet apart. If you set the up light more than 4 feet apart you won’t have enough light in the whole ball room and as well as the backdrop. Which would mean that it will look like you’re skipping out on something and that something is up lights. Our team is available to set up the core of lighting and everything you need to complete your venue backdrop and Decor just the way you wanted. Whether it’s a small event or a large event I design events has everything you need. And the best of all if you have a particular budget you like to stick with will help you with that as well. You don’t have to break your bank.